Beautiful baby girls short onesie, complete with matching bonnet has elegant knitted detailing on the front. Baby Girls Dusty Pink Romper Suit & Bonnet consists of dusty pink onesie and matching bonnet. The romper suit has short sleeves and round neckline. The sleeves have pretty pink lightweight knit on the trims. The front has delicate knitted pattern down the middle. The romper fastens a the back and underneath for easy nappy changes. The matching bonnet fastens on one side with wooden look button and has same lightweight frill on the front. 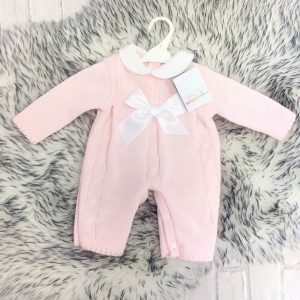 Elegant little outfit for your baby girl to wear this season.